Crafted from a single slab of black walnut, each of these pieces has been selected for grain detail and light colored sapwood edging. All edges are beveled, with fingertip access on the underside. Sealed with beeswax and food safe mineral oil. 1 1/8” hole in corner, farm logo branded in opposite corner. (Actual item will vary slightly in appearance, as each piece is unique). “Michigan” boards do not have a hole or fingertip access. 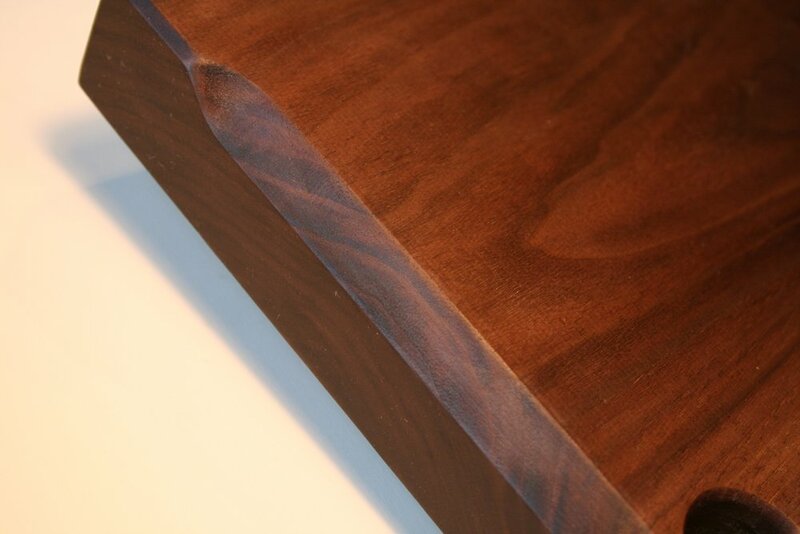 Crafted from a single slab of black walnut, these pieces have been selected for grain detail, small desirable burl marks or light colored sapwood edging. All edges are beveled, with a 1 1/8” hole in the corner and farm logo branded in opposite corner. Sealed with beeswax and food safe mineral oil. (Actual item will vary slightly in appearance, as each piece is unique). Crafted from a single slab of black walnut, these pieces have been selected for grain detail, small desirable knots, burl marks and light colored sapwood edging. All edges are beveled, with a farm logo in the corner. Sealed with Semi Gloss wood sealer. (Actual item will vary slightly in appearance, as each piece is unique).